The events that took place in the beginning of Ruby’s life are some no pet should have to experience. Ruby was found as a stray when she was about 18 months old. She had already birthed 2 or 3 litters of pups and was severely malnourished. 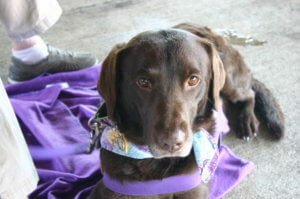 Luckily, Ruby was rescued, received medical attention and found a forever home. In April 2015, Ruby and her new owner, Jane, passed their first Pet Partners evaluation and started visiting people at St. Francis Hospital. Ruby’s first visit is one worth mentioning. An older gentleman was very angry upon Jane and Ruby’s entry into the room, but Ruby put her head in the man’s hand and he melted. The staff couldn’t believe their eyes or hide their tears of joy. Unfortunately, the man passed away later that week, but his last week of life was peaceful because of the love Ruby shared. Ruby is happily back to work after passing her second Pet Partners evaluation in March 2017. Pet Partners recognizes epilepsy as a condition and not an illness, which means Ruby is allowed to do her good work as long as her seizures are controlled, she feels well and an emergency plan is in place in the event of a seizure during a visit. But that is not all. 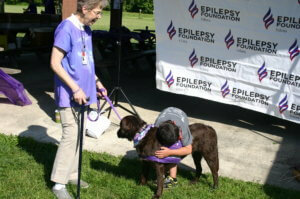 On May 1, Jan and Ruby attended a meet-and-greet event for the Epilepsy Foundation of Indiana with several other Pet Partners teams and was asked to attend the Walk/Run for Epilepsy event as the foundation’s new mascot! Ruby was a huge hit! Kids and their parents stopped to chat with Jan and Ruby, one kiddo mentioning, “Mommy, she has epilepsy like me!” Jan was able to talk with the parents about Ruby’s seizures, symptoms and treatment methods and she says she’s excited to continue to learn more about epilepsy and the ways to help Ruby through their involvement in the Foundation. I guess you could say they were definitely in the right place at the right time. 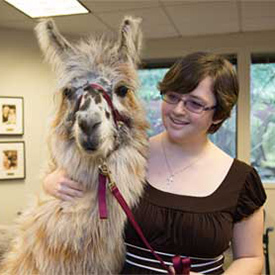 Ruby’s story is remarkable but the work of Jan her handler shouldn’t go unnoticed. 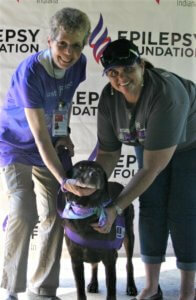 Ruby is Jan’s 6th Pet Partner, with two other active therapy animals named Ariel Rose and Gryphon. Ariel and Gryphon are very good at helping calm Ruby during episodes and all together they make one big, happy Pet Partners family. A big thank you to Jan, Ruby, Ariel Rose and Gryphon for sharing this story and for all they do for Pet Partners!